... and I'm sure there must be more. We start from the assumption that our student does not possess perfect pitch. This is such a total game changer, and so rare in my teaching experience, that we can safely leave it to one side. I don't have perfect pitch either. If you do, I guess you will need extra reserves of patience while your student hums and pecks their way around the keys trying to match the note they want. Playing a particular song by ear is generally not something you would do for the first time in front of an audience. Anything acquired by ear is still "learnt", however fast you can do it, and one of the differences from using notation is that something played by ear has to be reproduced entirely from memory. Motivation is a delightful by-product of this skill, since it opens up a world of playing exactly what you want, and the student will gladly practise because it is in pursuit of their chosen goal, not some external requirement. One of my teenage sons learns everything by ear. He doesn't take lessons, having once spent half an hour with me at a piano, quizzing me about technique and chords. When I am not teaching he sneaks into the music room and works hard on his pieces, entirely for his own satisfaction. His practising is highly repetitive! In fact, he practises in a very targeted and fruitful way because his goal every time is to consolidate the correct notes (having found them) and secure them in their context. I never prompt him to go and "do some piano practice" and he feels accountable only to his peer group for what and how he plays! Some of them have suggested he should learn to read notation like they can, but he doesn't feel the need. He is also teaching his younger brother to play some of his songs. Quite a useful alternative role model for a classically trained piano teacher to have in the household! It certainly convinces me that motivation is absolutely crucial to progress and enjoyment. YouTube is a major resource for learning and teaching without notation. I am deliberately not calling this "playing by ear" just for the moment, because what I'm referring to here is the cottage industry of video "tutorials", piano covers and Synthesia versions of every new hit. These vary enormously in quality and effectiveness but at their best can be a wonderful extra source of fun and achievement for your student. I feel that my role in this area is to show them how to pick a good version and then leave them to get on with it, with an open invitation to play the results for me at any lesson, and to bring problems for us to tackle together. Make it clear that it's all piano practice, and as long as they are not supposed to be concentrating on an upcoming exam or competition, that you are fine about these explorations. Playing by ear, in the old-fashioned "true" sense of the word, takes quite a long journey. It begins with remembering the pitch of a note. It extends into comparing this with the pitch of the next note, and knowing how to find that on the piano. It can include remembering the sound of each note in the scale and associating that with a place on the keyboard, and it can be partly about the chords that are present or implied. Remembering (and locating) notes already heard and used in the melody, recognising and knowing how to play common patterns, helps to build short cuts so that the player can keep ahead. But in the initial stages it is normal to grind to a halt whilst trying to find a less easy pitch. So, one of the essential building blocks of ear playing is hearing pitches in your head. When you start teaching ear playing, this is the first and most important ability to build in your students. Some of them get it faster than others, but the first steps (often briefly covered in beginners' methods but not normally followed through to higher levels) are to recognise pitches, first singly and then comparing one after another. This can start with singing but needs also to lead into playing, as that is a different and more complex skill than pitching the voice. You will use your teaching skills to tailor this to individual students. Many young people seem highly unwilling to sing pitches at all and it can take a lot of patience and tolerance to coax out a sound! As I am no singer myself, and use my voice only for sounding out pitches, I can use humour and empathy, singing along, reversing the roles ("you sing any note you find comfortable and I'll try to match it") and being rather matter-of-fact about my very basic singing. I often use the syllable "ba" - sometimes interspersed with "da" - as I find it quite relaxing and it sounds a bit jazzy too. It's also worth pointing out to the student that anybody who varies their tone of voice (such as the rise in pitch that shows you're asking a question) is doing an unfocused type of singing. Sometimes getting them to make swooping changes of tone up or down in a speaking voice can help to make the connection into singing - by then prolonging a single moment/tone in that swoop. 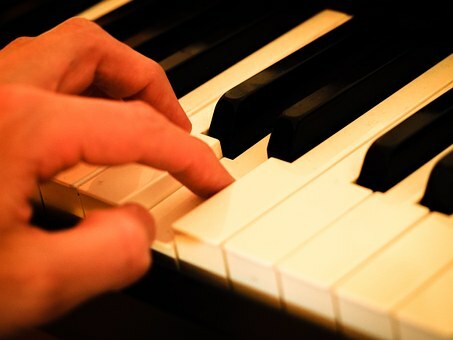 In developing the ability to find notes on the piano, there are many exercises you can try. You will develop a mixture of abilities that all contribute to the process. Start simple! Ask your student not to watch your hands as you play (like in aural tests in exams). Play two single notes, at least an octave apart. Is the second note higher or lower that the first? Keep it easy and successful at all times. You can bring the notes closer together and find out where their sensitivity starts to falter. How about three consecutive notes - ask the student to draw a shape in the air to show whether they went up or down, or made a hill or a valley. Relate this to places on the piano.... Try singing a shape and asking them to do a rough copy on the piano. The ones who like to visualise can draw shapes on manuscript paper (lines or dots) - or, if it is only two or three notes, you could even give it as a musical dictation. Beware of detaching it too much from actually playing the notes back, though: all we are trying to explore with these different approaches is the fastest and best processing route for the student to get from hearing to playing the notes on the piano. Part of the story will be establishing a databank of known shapes and musical gestures. So when you play a scale shape up or down, make sure the student knows that is what they are copying. Same with chords and arpeggio shapes. Intervals are another big help, and even though they are no longer included in ABRSM aural exams they are used in Trinity exams and should still be part of the training. Almost all method books cover them, but often emphasising written recognition. This is great for sight reading but you will need to supplement with listening, identifying and copying. This merges into work on scales and keys, transposing and general "geography". As you can tell, this whole area of teaching quickly diversifies according to the needs, abilities and ongoing successes of the individual student. However, the example I'll give you next shows just what a variety of skills is required for the musical memory to work well. This is a little experiment I tried with myself the other day to show that (within limits) you don't actually need a piano to learn a melody by ear, as long as you can imagine a piano keyboard. So let's try the first lines of "The Star Spangled Banner" in C major, playing the notes on an imaginary keyboard... Hear the opening notes in your head, or sing them under your breath. Can you spot the tonic? I make it the third note. So this melody starts with a tonic triad going down G, E, C and then straight up the arpeggio E, G, C to E, (you can do the rhythm as you go along, so you will have automatically paused on the C just below that top E); down by step to C, back into the tonic chord for E below, a step up to F sharp (try imagining an F to compare the difference) and on up to G. Repeat the G a couple of times and the next move is to that top E you already used, then some more steps down to B and A B C bring us to a falling tonic arpeggio. So much of this is made of established patterns that you only need to log some landmark notes such as the top E, the out-of-key F sharp and the A, and the tune is ready to retrieve when you next sit at a piano. You may have noticed how I just glossed over the moment of finding the tonic. How did we know that the third note was the tonic? As piano teachers with years of musical training it's pretty obvious and we run our own mental checks. These, we will have to set out step by step to the student. I start very early with this, beginning with any and every piece they play, because most beginner music is constructed in highly conventional ways. The first, least technical way to ask the question is "does it sound finished if we stop on this note?". If you play a scale upwards and stop on the leading note, or overshoot and stop on the supertonic, this can show them that they do have a sense of where the tonic is. This introduction to teaching ear playing cannot do justice to the subject (Lucinda Mackworth-Young has recently published an entire book on it, which is well worth exploring) and some students will always be more inclined than others to try this skill and persist with it. But even the smallest and simplest achievements in playing back what they hear, can bring a sense of achievement and provide another reason to congratulate your student in the lesson.